An artist's conception of a Super Venus planet on the left, and Super Earth planet on the right. An alien planet declared a super-Earth by NASA might not be so habitable after all. 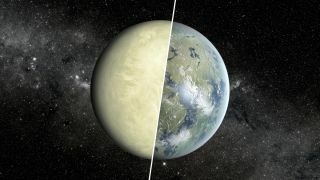 New measurements flag the planet (called Kepler-69c) as more of a "super-Venus" that would likely be inhospitable to life. The planetary status change is part of a larger struggle over how to define the habitable zone of a star. In recent years, scientists determined that the distance between a planet and its type of star is just one metric that hints at the likelihood of liquid water on its surface, which could fuel life. Other factors include the planet's atmosphere and even how the star behaves. "If the planet gets zapped with radiation all the time by flares from its parent star, the surface might not be a very pleasant place to live. But on the other hand, if there's liquid water around, that makes a really good shield from high-energy radiation, so maybe life could thrive in the oceans." Kepler-69c was, as its name suggests, discovered using the planet-hunting Kepler space telescope. NASA announced the find in April, declaring that the planet is about 1.7 times Earth's size and "orbits in the habitable zone of a star similar to our sun." A closer look at the planet's chemistry, however, showed the planet is actually just outside the habitable zone's inner edge. "For example, molecules in a planet's atmosphere will absorb a certain amount of energy from starlight and radiate the rest back out," NASA said in a follow-up press release in June. "How much of this energy is trapped can mean the difference between a turquoise sea and erupting volcanoes." The researchers also took the star's energy output and Kepler-69c's orbit into account when making the determination. It's still hard to say for sure if the planet is in the habitable zone, however. A next step could be to look at the atmosphere of the planet itself, but it is difficult for current telescopes to pick up the "signatures" of water, oxygen, carbon dioxide or methane that could indicate life. Even though the James Webb Space Telescope — slated to launch in 2018 — can examine planetary atmospheres, its capabilities are designed for planets that are far larger than Earth. Probing the atmosphere of Kepler-69c may have to wait for a more sensitive telescope, NASA said. A paper on the research was published June 20 in Astrophysical Journal Letters.